I find I am miffed this morning. The reason is this piece of news about the BBC's dastardly plans to fudge the issue of the Doctor's number of regenerations. 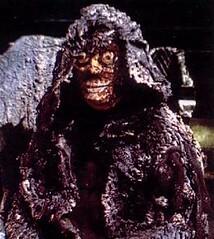 We have seen ``The Deadly Assassin'', in which part of the main plot is the fact that the Master is nearing the end of his final regeneration, and that he has to resort to all sorts of shenanigans in order to get a new series of lives. Equally importantly, we see Time Lords not regenerate in that episode. DOCTOR: Fascinating. And the heat from the flame causes oxidation of the chemicals in the rocks, and then, no doubt, a chemical reaction with rising superheated gases and you have your Elixir. The impossible dream of a thousand alchemists dripping like tea from an urn. MAREN: Do not try to understand mysteries beyond the reach of the mind. DOCTOR: Oh, I wouldn't think they're beyond a decent spectrograph, Maren. One could probably synthesise that stuff by the gallon, though the consequences would be appalling. OHICA: What do you mean? DOCTOR: What? Everyone trying to live forever? No. Death is the price we pay for progress, you know. MAREN: You speak in riddles, Doctor. The Time Lords were glad enough of the Elixir. DOCTOR: Only in rare cases. When, for instance, there's some difficulty in regenerating a body. We don't take it regularly like you, otherwise we'd fall into the same trap. MAREN: And what trap are we in? DOCTOR: Immortality. You must have been old when the Elixir was discovered. How many centuries have passed while you have remained unchanged. How long since anything here changed? MAREN: Nothing here ever changes. DOCTOR: Exactly my point. No progress. The fact remains that the Master was desperate to break the limit and could not easily circumvent it. If, and I stress the if part of that ``if'', the BBC (who writes Sarah Jane Aventures, anyway? Not Moffat, surely -- can someone other than the head writer make the decision to just ignore established circumstances? Can a spin-off (is it even canon?) set the story for the main show?) decides to undermine what geeks like me like to think of as FACT in a semi-related children's show and think that they will then have done with it, I believe they are sorely mistaken. For the moment I choose to believe that all this is just a smoke screen. I believe, and this optimism is in part due to the fact that I have now had coffee, the Doctor (if the report is right) is merely glossing over complicated stuff when asked a difficult question by a kid in a tense situation. We know he is lying, as we know more of the back story than this Clyde character. And he is of course right. It is technically possible, I think, to revive someone from the Matrix thingamajig and give them a new set of regenerations. I have a sneaking suspicion that that has been done for Rassilon in the New Series. And so you could technically argue that the Doctor is telling the truth. I feel that this is not a thing that should be treated lightly, even in a silly spin-off of questionable canonicity. They have certainly done enough weird and far-fetched stuff in the history of Doctor Who, so it shouldn't be a big problem to find a good way to explain away the regeneration limit. I think we should see the episode, though. Matt Smith FTW! Having now seen the episode (double episode) (legally) on BBC iPlayer, I can inform you that the exact number given by the Doctor is 507 (unless I misheard). This is of course absurd in view of earlier information. But, all this happens while this kid is interrogating him while he is backing up a ventilation shaft -- my theory is that he is not inclined to long and complicated explanations at that point (giant vultures are holding two of his old companions). 507 may be the ultimate final physical limit: 39 times through the fancy matrix thing on Gallifrey. It does not mean they have evaded the question of how to get part the first hurdle of the limit at 13. So there. Saying 13 is no more complicated (actually less) than 507. Also, I wonder why people made a fuzz about the regeneration-thing (which we all knew they would slip around anyway), and not about the fact that about 3 seconds earlier in the same episode, the Doctor says he doesn't have to be white, thus creating an opening for Mos Def as the next Doctor. is that if 507 just replaces 13 that is a disgrace. Whereas Mos Def would be an interesting development. People don't complain about the good things.